Anyway, the only thing they couldn't fix today was the cavity door in the ensuite - the door is not bowed, but the frame is slightly bowed. Apparently there's a couple of ways to fix it, so when he ges in contact with M they'll let us know how it'll be done. Still antenna connection and garage cornice fixing also outstanding. Finally got around to fixing my laptop last night - again, another product warning - DO NOT BUY HP BRANDED STUFF! Overpriced, underperforming, poor product support, zero long-term support (apparently a 3 year old laptop is so obsolete they're not supporting it in any way anymore) and crappy product design (nearly as bad as the xbox 360). 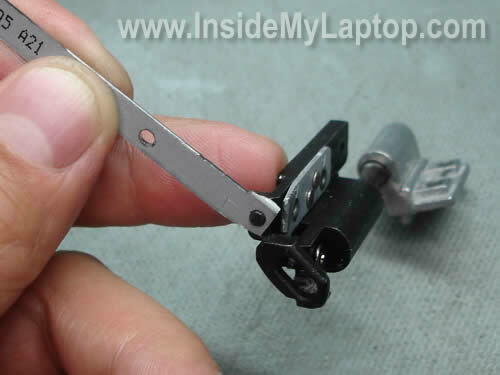 The main problem with HP notebooks - if you should be so daring as to want to actually open or close the screen on the computer, the hinge design is so poor that about 100% or them (more or less) will fracture. See this picture below - there's all the stress of the movement focussed on about 4mm of thin flexible metal. Idiots. Google "HP laptop broken hinge"and see how many million dissatisfied ex-customers HP have made enemies of. but ended up buying some ebay hinges and replacing them myself. Next notebook computer - maybe an Acer (I have one from 2002 that's slow but otherwise works 100%) or Toshiba I think - definitely NOT HP JUNK!